Dr Renee has been carrying out non-surgical nose reshaping for 5 years and has quickly established a reputation as one of the best. She regularly sees patients who dislike their nose shape for a variety of reasons; a hook, no bridge, bumps, too narrow, to feminine…the list is endless. When asked about nose reshaping she often says that she likes the procedure most of all that she does because she can usually achieve the expected results. Careful understanding of the anatomy and vessels is of course crucial and the procedure is one that only experienced practitioners should undertake, but the results in the right hands can be superb and the patient reaction equal to it. These are two of Dr Renee’s results. 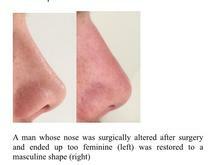 Both of the nose's shown here have been done by Dr Renee.